Loading up on Brighton and Cardiff assets? Our Gameweek 34 Daily Fantasy Premier League Tips select players for their goal and clean sheet potential. 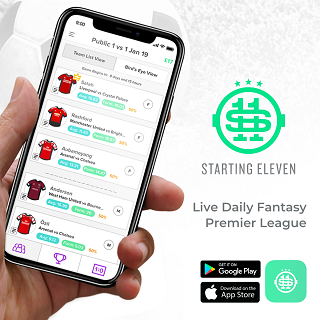 Whilst these selections are based on the Starting 11 game and scoring system, you may also find them useful and relevant for Fantasy Premier League Gameweek 34. Spurs have certainly got the new stadium bounce, after winning their opening Premier League game against Crystal Palace 2-0. Meanwhile, Huddersfield’s relegation fate has been sealed, scoring just 4 goals in their last 4 games and conceding 11. Another Spurs win is on the cards for Gameweek 34. Eriksen and Son graced the scoresheet for the curtain raiser, with Eriksen having 2 assists in his last 2 appearances also. Alli and Son are notorious for providing the goals in the absence of Harry Kane. It’s one clean sheet in 4 for Spurs, to go with their tally of 11 for the season. Lloris has made 80 saves and Trippier has 1 goal and 5 assists this campaign. It’s a huge 6 pointer at the bottom end of table, as Burnley and Cardiff go toe-to-toe in an attempt to avoid relegation. Cardiff are one of our double gameweek contenders, with 3 goals in 4 games. Burnley have 8 goals in their last 4. Barnes and Westwood have been at the heart of the goals for Burnley in recent games: between them they have three goals and 1 assist in their last 4 games. Victor Camarasa is the top scorer for Cardiff this season, with 5 goals and 3 assists: he has 2 goals in his last 4 games, with penalties more than helping him along the way. It’s the Brighton defence that appeals over the attack: it’s 6 clean sheets for the season, with the defence also getting involved in plenty of attacking returns. Bournemouth are on the beach and struggling away from home, with Cardiff stuttering in front of goal. Shane Duffy is the star of the Brighton defence: he’s had a fabulous season from an attacking perspective, with 5 goals and 2 assists. Dunk and Montoya aren’t doing bad alongside Duffy: Dunk has two goals and 1 assist this season, Montoya has 1 assist and both will accumulate points in the Starting 11 format for their defensive actions. Starting 11 have contests available this Saturday. 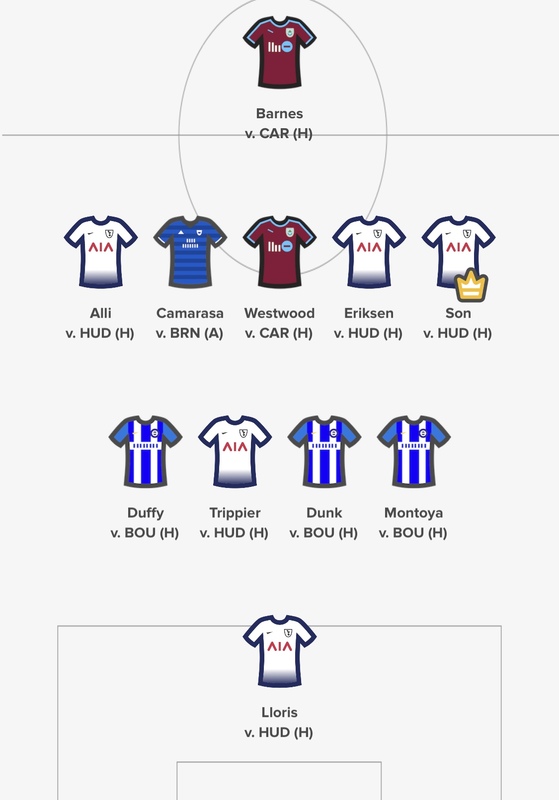 Here’s the Gameweek 34 daily team we will be lining up with on Saturday: Son is trusted with the armband. BEFORE YOU GO… There’s £25.00 on offer for the winner of FPL Tips Mini-League on Starting 11 this Sunday. It’s FREE to ENTER – Click the banner above to get involved!